The Lair of Filth: Filthy Music Review - Sacrocurse - Destroying Chapels 7" EP. Filthy Music Review - Sacrocurse - Destroying Chapels 7" EP. With 2015 fast becoming a distant memory it’s time to turn our attention to 2016 and some of the exciting releases it’s set to bring us. There’s no doubting 2015 was an outstanding year for underground music with exceptional music from many labels and bands across the globe. Thankfully 2016 so far looks to be every bit as productive and what better way to start my reviews for the year than with a new release from one of the underground’s finest labels – Iron Bonehead Productions. 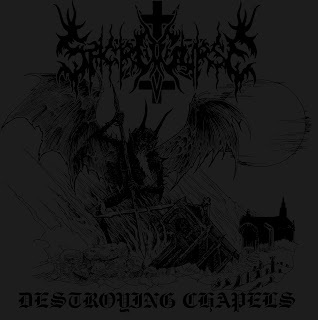 Destroying Chapels by Sacrocurse is set to destroy our speakers in January and it’s very encouraging to see 2016 get off to such a strong start. Currently based in Monterrey, Mexico, Sacrocurse was formed during December 2012 and since then have established themselves as an important band within metal’s underground. 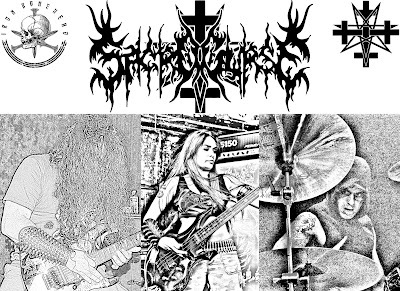 Soon after formation they signed to Iron Bonehead Productions who released their debut demo “Sulphur Blessing” on cassette in July 2013. 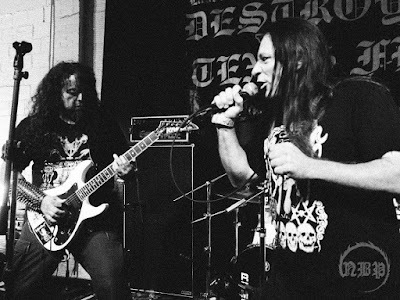 The demo immediately brought the band some deserved attention and during November 2013 the demo tracks were released on a split CD by Morbid Metal Records, a split they shared with Canadian band, Trajeto de Cabra. During 2014 the band released their debut full-length “Unholier Master” which further increased their profile on a global scale due to the high standard of music. Their profile was further enhanced by the fact Unholier Master was released by two very significant labels – Iron Bonehead Productions released the LP in Europe and Hells Headbangers released the LP and CD versions in the U.S. An exceptional start for a band that had only been formed a mere eighteen months. Whilst there were no further releases from the band in 2015 they certainly weren’t resting on their arses, with a new and strengthened line-up they played an extensive number of shows, sharing the stage with the likes of Deicide, Gorgoroth, Morbosidad and Negura Bunget whilst also playing festivals like Hell’s Headbash and Destroying Texas Fest. Also worthy of note and indicative of the respect Sacrocurse deservedly have is the fact that during Destroying Texas Fest the band was joined on stage by none other than the legend that is Mike Browning for a cover of Unholy Blasphemies, pictured below. 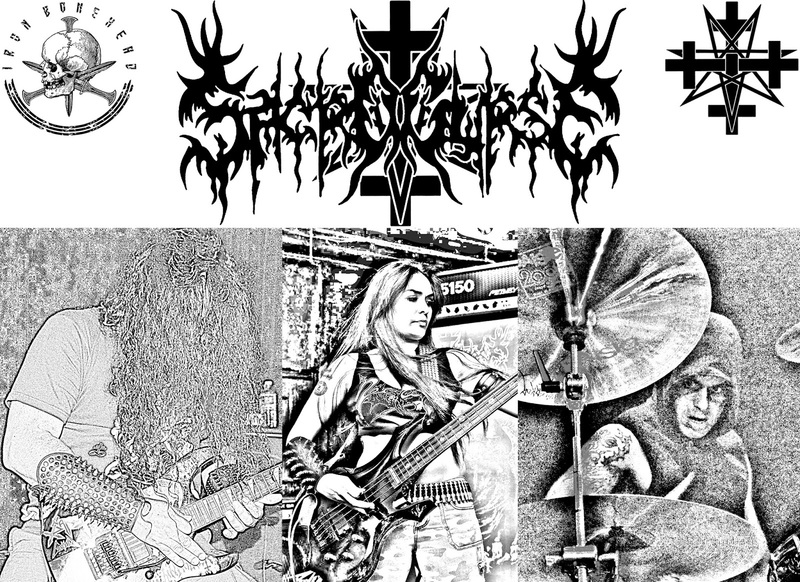 Sacrocurse thankfully managed to fit some studio time into their schedule during 2015 and as a result are set to bring us the exceptional Destroying Chapels 7” EP via Iron Bonehead Productions in January. The EP features four tracks across fourteen minutes, with the final track being a cover of the Bathory classic “Total Destruction.” Opener Total Devastation gets things off to a typically frantic start – a few high pitched screams pierce the eardrums for a couple of seconds before we’re launched into a full on death metal assault with no mercy. Sacrocurse play with typical South American barbarity, at a fairly frenetic pace and this EP sees them continue this trend. There’s little let-up for most of the EP’s duration as Sacrocurse keep the tempo as fast as it is punishing, with some frenetic yet exceptional drumming dictating the pace throughout. Sacrocurse are never short of quality riffs and Destroying Chapels is no exception, it’s littered with them from start to finish – the riff during “Sacrocurse Temple” is just one of many examples that plant themselves well and truly in your head from the first listen. However, it’s not just about the riffs, as with their previous output there’s also plenty of time amidst the brutality for some outstanding solos. Sacrocurse have strengthened and stabilised their line-up and it shows, there’s cohesion to their music throughout that illustrates the combined abilities of three very talented individuals that have spent the last year playing as a unit. I appreciate the fact it’s only January but with this first review I already have a release that will most definitely feature on my year end list of top EP’s – when it comes to year end lists a lot of releases from the start of the year can be forgotten or omitted but believe me, this will feature very highly. There aren’t many bands who have achieved what Sacrocurse have managed to achieve in such a short period of time and with a new album in progress 2016 could well be their year. Destroying Chapels by Sacrocurse will be available mid January via Iron Bonehead Productions.